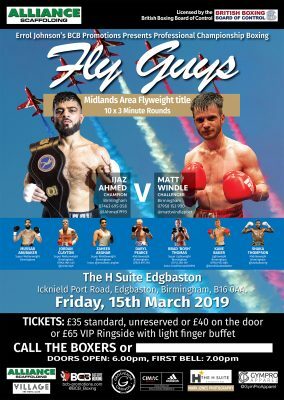 Ijaz Ahmed and Matt Windle go toe-to-toe for the Midlands Area Flyweight Title in March. Birmingham’s ‘Jazzy’ was crowned Area King back in December thanks to an absorbing ten round battle with Derby Conar Blackshaw. He makes a first defence against Poet-With-A-Punch Matt Windle at the H Suite, Edgbaston, on Friday, 15th March 2019. The title clash tops BCB Promotions’ first Second City show of the new year. Joining Ahmed on the card are a host of Birmingham boxers. Midlands Area Prospect of the Year, Shaka Thompson, is in action alongside Brad ‘Bosh’ Thomas and Jordan Clayton. Midlands Area Lightweight Champion, Kane Baker, features as do Zaheer Ashgar, Mussab Abubaker and Daryl Pearce. Tickets, priced at £35 standard (£40 on the door) or £65 ringside to include a light finger buffet are on sale now. Contact the boxers on Facebook or call 07463 695 058. This entry was posted in Breaking News, News. Bookmark the permalink.